Engage MC: Thank You Distilled! I've another thank you to make this morning. This time to Will and Duncan from Distilled. Distilled have an excellent reputation monitoring tool that we use as part of our reputation monitoring service. 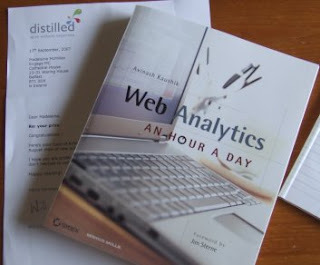 So good in fact that we upgraded our account and were entered into a prize draw to win a copy of Web Analytics An hour A Day by Avinash Kaushik. I was over the moon to hear that we'd won not just because it was a very thoughtful and appropriate prize but it was my birthday too and I've been running to check the post every day since. Nice design on the site as well by the way - saw your other post on that. I like it.